All shades on our website can easily convert to clip on by using the simple hardware below - just like we do in our showroom. Also, our small shades with 6" bottom and less already have the clip on built on. Clip on shades for chandeliers and small lamps are here. Email your questions and call us to order. STANDARD CLIP ADAPTER (standard bulb) - Attaches to any of our lamp shades. Make any lamp shade clip onto a light bulb by using the STANDARD CLIP ADAPTER. This clip adapter positions the shade about 1.5" higher than the flush clip adapter. FLUSH CLIP ON SHADE ADAPTER (standard bulb) - Makes any lamp shade clip onto a light bulb, positions the shade about 1.5" lower than the standard clip adapter adapter. 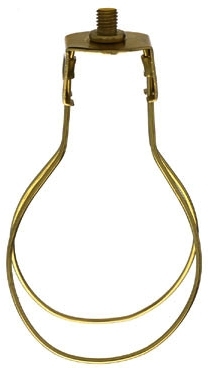 CANDELABRA CLIP ON SHADE ADAPTER (chandelier bulb) - Makes any lamp shade clip onto a candelabra (chandelier) light bulb. Our chandelier shades already have this built on. Shade Riser - 1" or 2" tall - Screws onto a CLIP ON SHADE ADAPTER to quickly adjust the shade vertical position - Raise or lower a lamp shade.